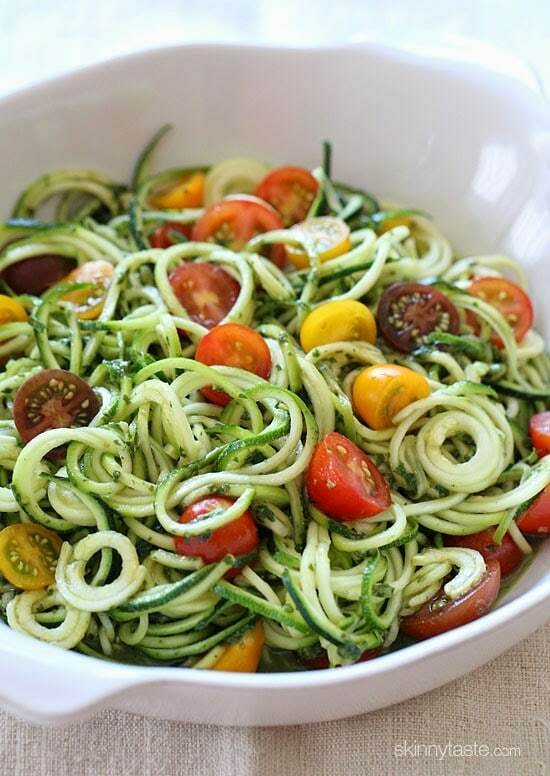 Raw Spiralized Zucchini Noodles with Tomatoes and Pesto is my favorite easy, end-of-summer vegetarian dish made with raw, garden vegetables and homemade pesto. As much as I look forward to the Fall, I’m not quite ready for summer to be over. Having fresh herbs at my fingertips is what I’ll miss the most, so I’m taking all my basil and making skinny pesto with it to freeze and use throughout the year. And let’s not forget to mention summer tomatoes, this is the best time to eat them!! One thing I should note if you’re making this for one, I would make the whole batch of pesto, but only spiralize 1 small zucchini and add 1/4 of the pesto. This needs to be eaten right away, if it sits too long it will get watery. Slowly add the olive oil while pulsing. Set aside. Spiralize the zucchini, cut it into smaller strands if they are too long and place them in a work bowl. Toss with the pesto and tomatoes and season with salt and pepper as needed. So you don’t cook the noodles?! I just made the skinny pesto and it came out very oily, too much oil for 1 cup of fresh basil. It only came out with 2 tbs of pesto. Seemed to me that I needed to put more basil in the recipe. When pulsing the ingredients all of it stuck to the side of the food processer. Very disappointed. What could I have done to remedy the problem? I made this tonight and added some thawed frozen pre cooked shrimp for extra protein. It was tasty and beautiful. Next time instead of shrimp I might try adding some kind of bean – what do you think, cannelini? 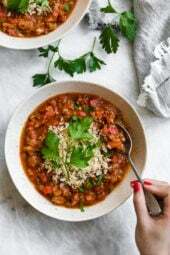 Garbanzo beans? Something else? I have an ice cube tray, frozen, full of your pesto, but I don’t know how much to thaw for this recipe… Thoughts? Has anyone made this ahead of time? Having a dinner party later tonight. Worried the noodles may get soggy if I toss too early. Pushing zucchini through a spiral cutter doesn’t transform it into anything else. It is not pasta. It’s just raw zucchini with tomatoes. Nothing more. It’s cold, watery and not very appetizing Yes, it’s colorful, but it’s very, very dull to eat. 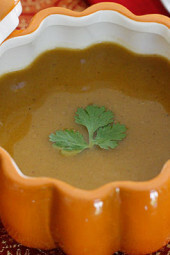 You recipe indicates that it needs to be eaten right away or it gets watery. what causes it to get watery? Is it just due to the fact that the zucchini is spiralized or does the pesto break it down? I’m looking to spiral the zucchini in advance to take in my lunch for a healthy alternative. I have the KitchenAid slicer and spiralizer so taking that to work isn’t an option. It’s the zucchini that releases lots of water as it sits. 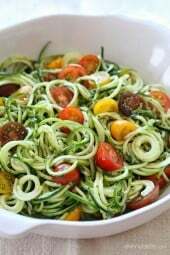 I am COMPLETELY addicted to the spiralizer and zucchini noodles now! My hubby wasn't on board with the raw zucchini noodles, so I sauteed them like you do for your lemon garlic shrimp with zucchini noodles – sauteed in garlic olive oil with S&P and then tossed with pesto. My husband is a pesto fanatic, so I made the skinny chicken pesto bake to go on top of the noodles. Low carb HIT!! Is there something I can sub for the tomatoes, I'm just not a big fan of them. How about roasted red peppers? Do you know if there is a difference between your spiralizer you posted and the "Spirooli"? I am waiting to invest in one but the Spirooli is a little bit cheaper but gets worse reviews. BUT, they look exactly the same?! Anyone own either of these and can comment on them? Thank you! I blogged about this one as well. I added a cup of peas to the pesto and had wonderful results. Didn't catch it when I bought it, but I ended up with a bunch of Thai basil. This is fabulous with Thai basil pesto! My spiralizer arrived yesterday and last night I made this! It was so easy and just absolutely delicious! Gina, you rock!! I don't usually eat my zucchini raw so mixed all this up, sauteed w/ a little olive oil for about 2 min, topped it with a few slices of avocado and served with leftover chicken. Dinner was done in about 15 min and kept me from caving into "Pizza Friday" after a long week and ruining my progress. Thanks for sharing, it was amazing! 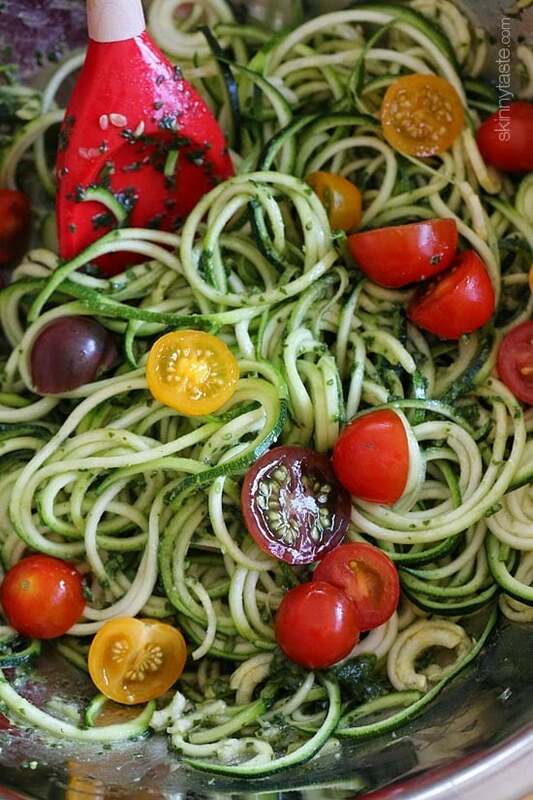 I love my spiralizer and have a ton of tomatoes and zucchini in my kitchen right now. 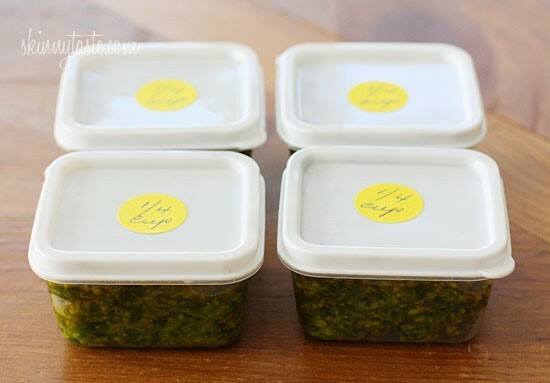 And pesto in the freezer from last summer… Pinned to make tomorrow night! I have made the zoodles with my vegetti and love it. But I made your pesto and it was very thick…like paste. I had to add two more T evoo to get it pourable. Are you on those measurements? But it was tasty! And I used lemon basil…mmmmm. I am positive on the measurements, but it's pretty thick so I used a spatula to incorporate it, and after a minute or 2 the liquid from the zucchini releases and helps mix it all together. My veggetti spiralizer just arrived! only $12 on amazon and doesn't take up much space. Just sauteed some zoodles- came out great. excited to try this! Thank you for giving your recommendation on a spiralizer/slicer! I've been wanting to purchase one for weeks but I'm always so overwhelmed when I hit 'search' on google with all the results that pop up! This picture pushed me to order my spiralizer, which I have been putting off. I cannot wait to make this! I really need to pull out my spiralizer more often! Your zoodle dishes always look so good. I use the. Spirooli spiralizer from Bed Bath and Beyond. It works great for me! I get lots of requests for them, but I also do so many without. I basically share what I eat! Bed Bath & Beyond has them, too, but cheaper of you have their 20% off coupon. I don't have the spiralizer … yet … so last night I used angel hair pasta, home grown tomatoes, julienned zucchini, sauted diced onion and pesto! It was a nice half home grown meatless meal. Boiling the water for the pasta took most of the time but I had it on the table in 15 minutes or so. That's fast food! I was just thinking about what I wanted to take out Out for dinner, now I don't have to take anything out to make this delicious and simple meal for dinner. Thank you! Nom Nom Nom, super recipe. Loving all the simple ingredients, the colour – the whole shebang! This looks so light and fresh. LOVE!! Such the perfect summer meal. And so pretty! I added garbanzo beans. Delicious! 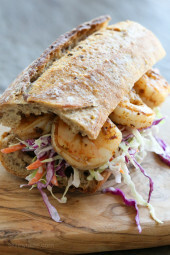 My mouth is watering looking at these photos Gina! Great combo, a total classic! Pinned. They have a 'vegetti' at Walgreens! I finally bought a spiralizer and pulled it out for the first time the other day to make a similar recipe to this. LOVE the pesto idea! This looks delicious! I love the way the zucchini looks. I'll definitely have to try this in a few weeks… I need to take a side to a get together. 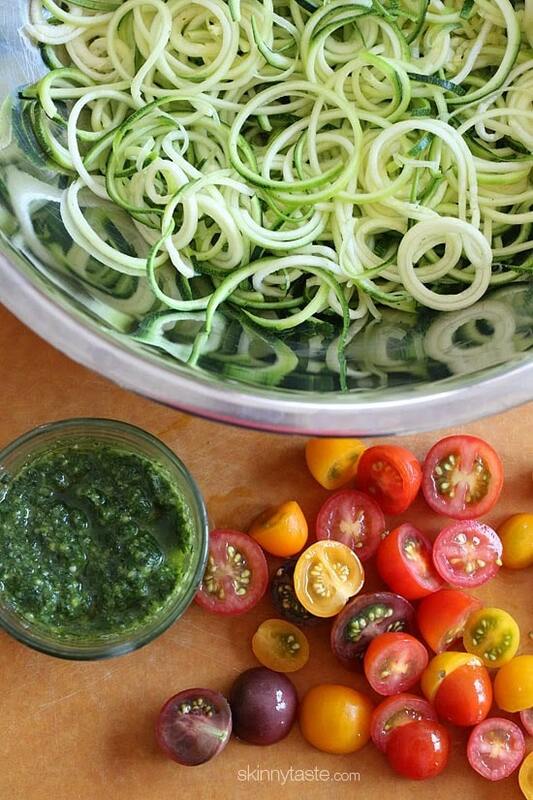 Tomatoes are just so perfect right now, and combined with the pesto these zucchini noodles look wonderful! I'm wishing I had a spiralizer! I've made zucchini noodles with a potato peeler. Works great but not as pretty. I absolutely love my spiralizer. It is SO easy and quick! And clean up is a breeze. I used a Groupon and got mine for about 1/2 price. Such a great idea!! I love zuchini noodles lately and can't wait to try this recipe. It's great for using those summer tomatoes, which I just stocked up on at a local produce stand. I would also add chicken breast or even salmon to this to make it a complete meal. I use a vegetti spiralizer. Works well and easy to store. Thank you for sharing that! I was debating on which type to purchase and while the one she has looks great, I hated having to try and find a place to store it! I actually tried to make a version of this last night by taking your spaghetti with garlic scape pesto recipe and replacing the pasta with zoodles. I roasted some grape tomatoes and added them as well. I didn't come out as good as I expected though.The flavor was very watered down. I had cooked my zoodles (maybe about 4 minutes) to soften and warm them up so I imagine the problem was caused by the water that was released during the cooking process. I'll give it another shot this way and hope for better luck! And I saute mine in coconut oil, YUMMY!!!!!!!!!!!!!!!! Yes for this recipe I would not cook the zucchini, it doesn't need it. keep it raw!! I steam mine to eliminate all that water that you get from boiling it. works great. Makes great Zucchini pasta !!!! Had friends over for dinner and they loved it with my spaghetti sauce and meatballs. Sweat your zucchini noodles. 20 minutes @ 250 in the oven between a paper towel. It will help dehydrate them so they will not get soggy in the cooking process. Makes a huge difference. I love this meal! So, so perfect for the end of summer!